One of the great things about tankless water heaters is that you are able to get hot water instantly. That means when you wash, cook, and clean you get hot water for those tasks without having to wait. Not only is this great because you don’t have to wait for hot water, but it is a more energy efficient way to get hot water. But like all plumbing systems, tankless water heaters can become susceptible to repairs when they don’t have the proper maintenance. In order to keep your tankless water heater in the best shape, it is so important that you schedule routine plumbing maintenance. If you hold off on maintenance, you can expect your tankless water heater to have some issues. For homeowners and business owners who need tankless water heater repairs for their property, please contact the experts at All About Plumbing & Septic. Do You Need Tankless Water Heater Repair? All About Plumbing & Septic Can Help! All About Plumbing & Septic is a plumbing and septic company that is able to provide quality and reliable tankless water heater repair in Mills River, Hendersonville, and Asheville, NC. If you notice something off about your tankless water heater but you aren’t sure it’s a case for alarm, you should call us anyway. It’s better to be safe than sorry since repairs that are put off can lead to a whole tankless water heater replacement. To avoid getting a complete replacement and keep your tankless water heater in good condition, call us at 828-778-2425 today. We are the professionals you can count on for amazing water heater repair service. Due to how convenient tankless water heaters are, it is so important that they are in excellent shape. Unfortunately, things can happen whether it’s because of the system or there was a lack of maintenance, a tankless water heater will eventually need repairs. The most common issues that occur in regards to tankless water heaters are system overload, mineral buildup, flame failure, or an exhaust blockage. While these seem serious, they can easily be fixed when you call for repairs. While tankless water heater repair is very important, it can be hard for a lot of people to know when repairs are needed. Knowing when your tankless water heater is malfunctioning or damaged will give you the knowledge to call for repairs at the right time. Below are some of the signs you need tankless water heater repairs. Higher Energy Bills: A tankless water heater is supposed to reduce energy bills so if you see an increase in your energy bills, the culprit might be mineral buildup in the tankless water heater. Inadequate Water Flow: Another thing to be aware of is that if minerals build up in the tankless water heater, they can cause slow water flow from faucets and taps. Insufficient Hot Water: Because a tankless water heater provides hot water instantly, it can be a cause for concern when you aren’t getting hot water. Fluctuating Temperatures: This can also be called a cold water sandwich, but its when the water is warm, then cold, then warm again. Turn Off On Its Own: If there issues within the tankless water heater than it can cause it to turn off on its own. Bad Taste: If there is mineral buildup in the tankless water heater, it will require repair service to fix it. Strange Color: Water that is discolored in any way isn’t a good sign and should be addressed immediately. Is your tankless water heater exhibiting any of these issues? If so, call our plumbers and we can set up a time for tankless water heater repair in Mills River, Hendersonville, and Asheville, NC. Residential and commercial property owners who are wanting to update their water heaters typically go with tank water heaters. Tank water heaters are great and very reliable, but if you are looking for a more energy-efficient that can save you a lot of money, tankless water heaters are the way to go. At All About Plumbing & Septic, we are able to repair and replace tankless water heaters, as well as provide quality water heater installation service. More and more people are investing in tankless water heaters because when it’s not in use, it doesn’t consume energy; with traditional tank water heaters, they are constantly heating water within in a tank. 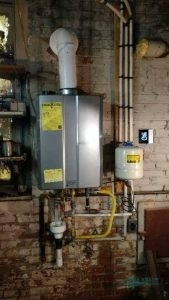 We Also Offer Tankless Water Heater Installation Service. The beauty of investing in a tankless water heater is that it only uses energy when you are using it. When you need to take a shower, wash your hands, or do a load of laundry using warm water, the tankless water heater will heat up water on demand. You don’t have to worry about a water heater that is constantly heating up water, because the tankless water heater will only heat up the water that you need since it provides on-demand hot water. If you have questions concerning a tankless water heater installation or perhaps you need tankless water heater repair in Mills River, Hendersonville, and Asheville, NC, contact our office today. A tankless water heater not only offer on-demand hot water, but this type of water heater comes in both electric and gas options. Not every house or business is going to use the same energy source to run their appliances, which is why it’s so great that tankless water heaters can either be electric or gas. While having options is great, as well as having unlimited hot water, there are other reasons that people are wild about tankless water heaters. 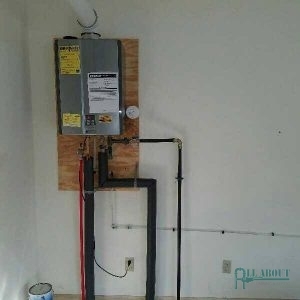 Because tankless water heaters are a compact size, they don’t take up a lot of space. They are able to reduce water waste since you are getting hot water whenever you need it. These types of water heaters are able to last 20 years, whereas tank water heaters last 10 to 15 years. You can take showers as well as run other appliances and still have the hot water that you need. Since they are so energy-efficient, they can save you a lot of money in the long run. To schedule an appointment for tankless water heater installation, give our plumbers a call at 828-778-2425. If you currently own a tankless water heater and require tankless water heater repair in Mills River, Hendersonville, and Asheville, NC, we can help you with that, as well. All About Plumbing & Septic is the company to call for all of your tankless water heater needs. Updated on January 18, 2019 at 3:37 pm by All About Plumbing.